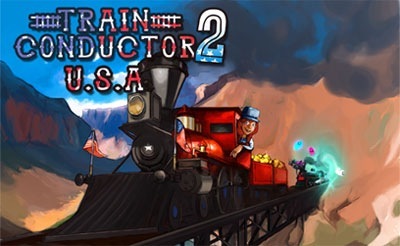 Train Conductor 2: USA [iTunes $0.99] by The Voxel Agents has quickly become one of my favorite games, offering a pitch-perfect blend of sights, sounds and silky smooth gameplay all wrapped up in a universal app package. 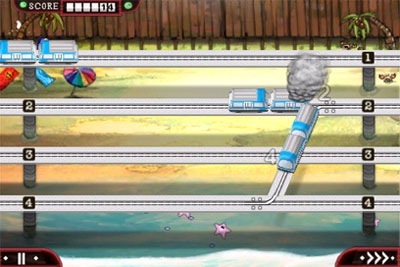 The brief tutorial that starts things off introduces the game mechanics: numbered trains enter from either side of the screen and you have to create a temporary switch to guide them to their correct track while avoiding collisions (you really don’t want an NTSB investigation clouding your resume). Once you’ve got the hang of things, you’re off to Miami to take control of a beachside monorail system. 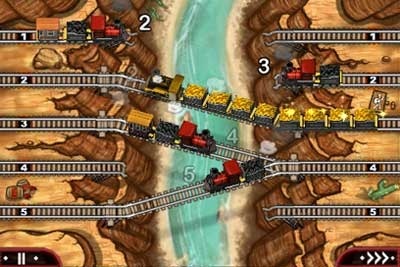 These are relatively slow moving trains, giving the player the a chance to improve their switching skills. As the round progresses, faster moving express trains appear, keeping this location challenging. 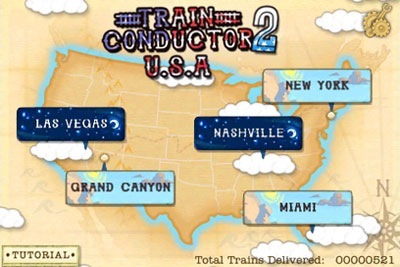 Once you’ve safely delivered a certain number of trains, the next location on the map is opened up. Nashville and it’s apparently haunted by the ghosts of long forgotten musicians. I found this location to be the easiest for high scoring. Since they are incorporeal, there are no collisions, but the red demon trains must be delivered to the correct track. And these ghost trains move very fast. 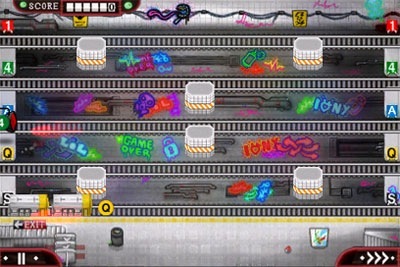 Playing this level on the iPad, I found the multi-touch to be extremely responsive as I switched trains with both hands. After scoring another hundred trains delivered, it’s time to visit the Big Apple where you are put in charge of 5 subway lines. This was by far the most challenging location for me to play since you have to route the trains around pillars and the tracks are labeled with both numbers and letters. This level requires an extreme amount of focus to navigate successfully. The attention to detail that the developers have put into this game is really apparent in this level since the subway lines are authentically color-coded. 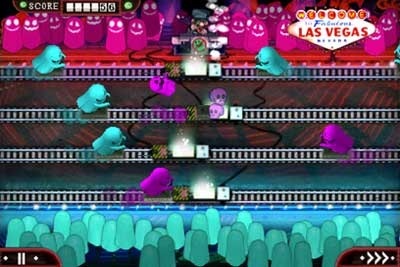 Once you’ve passed the 300 trains mark, it’s time for another trip into the ghost world for the next location: Las Vegas. Here, the gameplay changes up a little bit since you aren’t switching the trains between the tracks. Instead, you have to work a little pick-n-flick to save the ghosts before they fall into the traps set up at the center of the screen. The entire game, and particularly this level, really gives your hand-eye coordination a workout. It’s a great way to hyper-focus your noodle during a busy day! At the 600 trains delivered mark, you get to visit my home state, Arizona, for a trip to the Grand Canyon, where you have to keep the steam trains from plunging into the gorge below (talk about pressure). I should mention that you can revisit any of the locations that you have unlocked as well. Since each level plays like it’s own game, it’s fun to pick and choose. My daughters both love the game, but they each like different locations best. I haven’t yet reached the score to unlock the Roswell, New Mexico location which was recently added, but I’m sure there are aliens involved. Also planned for a future update is a Seattle trainyard. The replay value of this game is very high and at 99 cents, this universal app is a steal. I am quite surprised that the game isn’t in the top charts, since it is definitely in my top ten.